Cole, 24, was born and raised in Hawaii on the island of Oahu, a ten-minute skate away from Sandy Beach Park where his career maintains its roots. 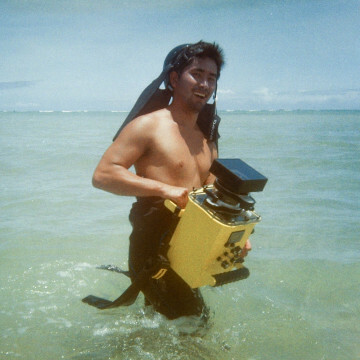 It was at Sandy’s that Cole first took his underwater camera housing into the ocean at the ripe age of 15. His first housing was red and it supported only photographs at the time but it allowed Cole to become comfortable in the ocean with equipment (other than a surfboard) at an early age. Being able to document his love for the ocean through such a unique and organic perspective deepened his love for the craft of the capture while challenging his artistic eye simultaneously. After receiving some formal training at the Academy of Art in San Francisco where he studied photography, Cole’s career took a sharp turn. He found himself back on the island, this time behind the lens of a video camera. Navigating an entirely new realm of work with the help of YouTube tutorials, trial and error, Cole found himself teamed up with a group of young, Hawaiian surfers also straddling the lines of growing up and becoming real professionals. Since then, success has found the group and they have traveled the world together chasing both waves and dreams. Cole’s career has since become multidimensional and his client list highlights his range of capability as he steps into his own as a burgeoning creative in the industry. He’s proud to have worked with the likes of the World Surf League, Quiksilver, the Travel Channel, Surfline, Surfer Magazine, Surfing Magazine.